Being the first Google-branded smartphone, the Pixel and Pixel XL definitely started off with high expectations and unique features. One such unique feature is the Fingerprint Gestures, which allows you to swipe for notifications directly on the fingerprint scanner. With the expected release of 7.0 Nougat, there are sources that suggest Samsung could bring fingerprint gestures for Galaxy devices. While the feature first surfaced with Huawei and was expected to catch onto Huawei’s very own Nexus 6P, it never happened. Samsung has been promising to bring a lot of features to the public release of Android 7.0 Nougat for Galaxy S7 and S7 Edge. 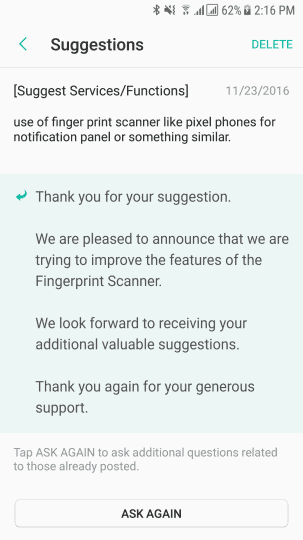 Based on a report by one of the customers who is a part of the Galaxy Beta Program, Samsung is “trying to improve the features of the Fingerprint Scanner”. Essentially what the fingerprint gestures for Galaxy devices would do, is enable you to swipe notifications without reaching out to them. By simply swiping down on the fingerprint scanner, the notification shade would drop down, which could work even better with the front-facing fingerprint scanner on the Galaxy devices. However, since Nougat for Galaxy S7 and S7 Edge is still in beta, there can be no promises made on what will be included in the final release. There are also rumors floating around that suggest the upcoming Galaxy S8 could feature a back-facing fingerprint scanner, which would be a steep turn from the traditional design. Do you think the fingerprint gestures for Galaxy devices could further improve the user experience, or is it just a fancy gimmick? Do let us know your thoughts in the comments section down below.